The Gold Rush received Academy Award nominations for Best Music and Best Sound Recording upon its re-release in 1942. It is today one of Chaplin’s most celebrated works, and he himself declared several times that it was the film for which he most wanted to be remembered. 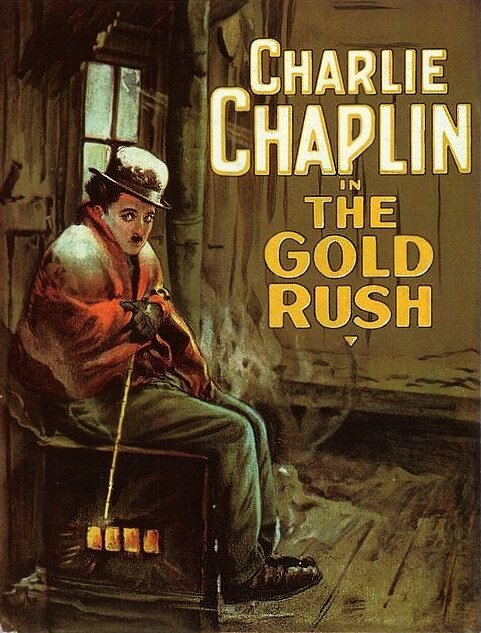 The idea for this film came from Chaplin looking at the pictures of the Gold Rush in Klondike in 1896. At the same time, he accidentally read a book about immigrants who trapped the snow in Sierra Nevada, had to eat their own boots or the corpses of their friends. Chaplin, who believed tragedies and comics were not far from each other, decided to combine these stories of deprivation and horror in comedy. He decided that his famous rogue figure should become a gold-digger who joins a brave optimist determined to face all the pitfalls associated with the search for gold, such as sickness, hunger, loneliness, or the possibility that he may at any time be attacked by a grizzly. In the movie, we see scenes like Chaplin cooking and dreaming of his shoe, or how his starving friend Big Jim sees him as a chicken. The Gold Rush was a huge success in the US and worldwide. It is the fifth-highest-grossing silent film in cinema history, taking in more than $4,250,001 at the box office in 1926. Chaplin proclaimed at the time of its release that this was the film for which he wanted to be remembered.